You know what itâ€™s likeâ€”you get a letter in the mail, then another one, and another, and another… All of them junk! You know, mail you have not solicited. Then the Pharmaceutical Journal (PJ) is delivered, and because of information fatigue or simply because it sneaks in with the junk mail, you donâ€™t bother to open it, or you simply miss it! A white and orange A4 envelope arrived at our door this week (figure 1). 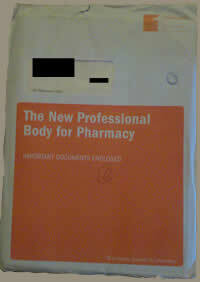 It has the following written on it: The New Professional Body for Pharmacy – Important Documents Enclosed. We at bookapharmacist.com believe that this is a document you cannot afford to miss! Please read through this document very carefully and send your comments to the transitional committee by January 9th. This document is the culmination of an extremely open consultation process “involving literally thousands of pharmacy professionals and their organisations, steered by a Transitional Committee…” Important changes are afoot in the way our profession is led, and this represents your opportunity to shape its future. If you don’t take part, there is a distinct possibility that you will not get the Professional Body you want or deserve. In a climate of healthcare reorganisation and change, this will represent a huge opportunity missed! You might also want to read the contribution by our CEO to the Transitional Committee (The Case for Community Pharmacy). You can give comments by either tearing out the free post form at the back of the prospectus, or using the feedback facility on the TransCom website: http://www.transitionalcommittee.com/feedback.html. Everyone is talking about the White Paper and how important it is for the future of our profession (Pharmacy in England: Building on strengths, delivering the future). Tucked inside this document is a reference to a speech by the prime minister in January 2008 describing plans to introduce a system of vascular risk assessment. The aim of the vascular checks program is to offer risk assessment for diseases affecting the vascular system, including diabetes and chronic kidney disease, to everyone over a specific age. Pharmacists undoubtedly have a key role to play here. When the South West Hampshire Local Pharmaceutical Group (LPG) invited Dr Chris Arden, a GP in Chandlers Ford with special interest in cardiology, to speak to us about managing patients with cardiovascular disease in primary care, we jumped at the opportunity to attend. It was a comprehensive presentation with the aim of highlighting current thinking in cardiovascular medicine. The presentation also outlined the potentially significant role of community pharmacy in the primary care prevention of cardiovascular diseases. We thought some of our colleagues might find the presentation slides very informative and asked Dr Arden to allow us to publish the presentation on our website, and he agreed. Many thanks to Dr Arden! We will make a contribution to a charity of Dr Arden’s choice as soon as we start to generate income from this project. To view the presentation, you need to login to http://sites.bookapharmacist.com and navigate to Presentations – Bookapharmacist.com. We will continue to work to bring valuable information and support to our members. If you are not yet a member or haven’t yet felt an interest in joining, we hope you will read more about the project here. We will be waiting to welcome you into our fold. Thanks for now and have a great week.